Mmmm…and here’s another quick and simple Christmas sweet treat for you and your loved ones. Don’t say I didn’t spoil you this year! Preheat the oven to 150°C/300°F/gas 2. Put your egg whites into a clean bowl and whisk them at a medium speed until they start to form nice firm peaks. With your mixer still running, gradually add the coconut sugar and a pinch of sea salt. Turn the mixer up to the highest setting and whisk for 7 to 8 minutes more until the meringue is white, glossy and smooth. If it feels grainy, whisk for a little bit longer, being careful not to let the meringue collapse. Line a baking tray with baking paper. Shape into blob into a circle or oblong about 20cm in diameter. Put the tray into the oven and bake for 1 hour until the meringue look slightly golden and are fluffy in the middle. 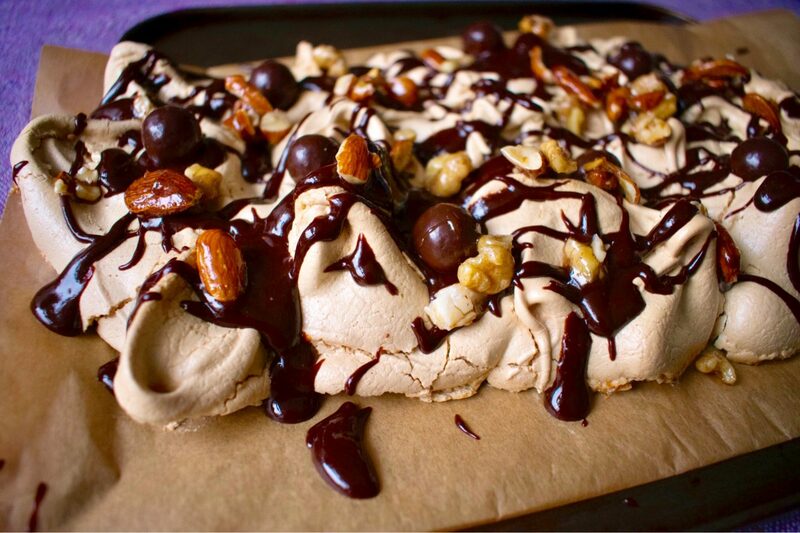 Spoon the melted dark chocolate on top of the meringues and smooth it out. Scatter over your nuts and dark chocolate and enjoy!